The 1908 Games were originally intended to be held in Rome, but two years previously, Mount Vesuvius had erupted causing widespread damage and requiring the diversion of funds. London was chosen instead. Apparently influenced by watching the unofficial 1906 Athens games, the Royal Family requested that the marathon start at Windsor Castle. The race set off from the private East Terrace, possibly so that the royal children could witness its start, but more likely to enable the crowd to be controlled. At 2.33pm on the 24th July, the race began, with the Princess of Wales pressing an electric button to give the signal for the pistol to be fired. 55 runners from 16 countries set off through the Sovereign’s Gate, down the High Street and across to Eton. 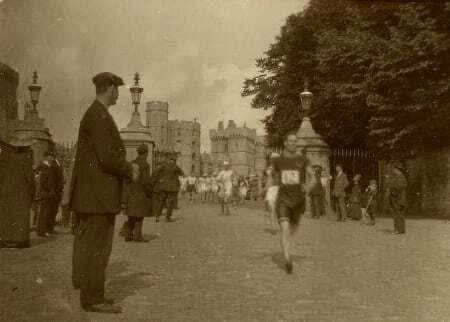 This photograph comes from the Kathleen Naylor collection and shows the start of the 1908 Marathon race, with the runners coming through the Castle Gate. Kathleen’s father, Fred, was a lay clerk at the Chapel for over 60 years from 1895 to 1957, and these photographs form part of the collection of records covering his life and those of his children at St George’s and the many events in and around the Castle that they witnessed. The photograph shows George Lind, the first Russian to compete in an Olympic track and field event, who eventually finished in 19th place. However, it was an Italian that would become the most famous competitor from this event. It was an extremely hot day, and many runners had already dropped out, including the favourite. Dorando Pietri, a pastry chef, entered the White City Stadium first, but was visibly exhausted. He collapsed, umpires ran over and helped him to his feet, and he staggered on. Then he fell over again, and once more, the umpires helped him up. He collapsed five times in all in the short quarter of a mile that lay between the gate and home. By now, the American competitor Johnny Hayes had entered the stadium; no one in the crowd wanted the American to win, they were Britain’s great rival, and several quarrels between the teams about controversial umpires’ decisions had led to bad feeling. Eventually, with the crowd cheering on, Dorando was half carried over the finish line, winning the race with a time of 2 hours, 54 minutes, 46 seconds. Johnny Hayes finished half a minute later at 2 hours, 55 minutes, 18 seconds. As a consequence of the assistance he had received, after crossing the line Dorando was disqualified and the medal went instead to Hayes. Yet many felt that Dorando was the true winner, with his heroic determination to finish. The next day, Queen Alexandra awarded him a gilded cup in recognition of his achievement. Up until the 1908 Olympics, the marathon was not one of the best known or best attended athletic events. There was not even a recognised official distance. The 1908 London Olympics completely changed all that, and marathons became an annual event in London as the Polytechnic Marathon.